Oh dear, panic panic! I am glad you managed to think fast and work fast, and be rewarded with a tasty, beautiful yam cake! Phew! 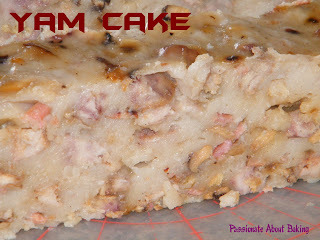 The yam cake looks yummy, new to me!! tempting.. Ya boy! Was panicking in the kitchen with perspiration dripping down the apron! Hahaha... It was quite unsightly actually. Fortunately, the yam cake didn't fail me! Boy! I was truly lucky this time. It's not always the case, isn't it? Yam cake is truly nice. You should try it! Jane,that was so smart of you trying to salvage things in kitchen. I'm happy it turned out well for you. I just hate throwing things away, especially edible F-O-O-D! Wooo..yam cake! I love yam cake since I was a little girl..:) My version is without "tang flour". Is the texture really smooth? Then I got to try this out! 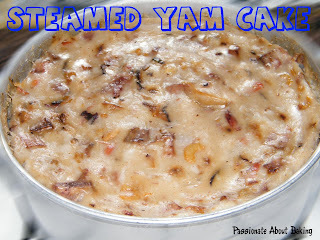 Yam cake is one of my favorite food. When I eat "Ju Chiong Fan" I must eat it with this yam cake. But I have not tried to make it myself yet. This one looks very delicious one! I have been craving for home made yam cake for the longest time ever! My mum used to make superb yam cake but now she stop liao. Drop by my house on your way home. I still have some in the fridge. Can give you some. ;) But must qualify first, might not be as nice as your mum's! Thank you. I'll be glad to share too!